Three card poker is a casino game based on playing with one deck of 52 cards. While most card-based casino games originated in Europe in the 1700s before being adopted in the United States, three card poker is newer than most casino games and has an entrepreneurial beginning. Understanding the basis of three card poker and how to play it effectively can help even beginning players beat the dealer and win bonuses. In 1994, Derek Webb came up with a poker game that followed three requirements. included a house edge high enough to attract the attention of casinos. The game was a new endeavor, and he started a company to market three card poker in Great Britain and the United States. The U.K.’s casino association had regulations against this type of game, so Webb first focused on getting three card poker into play in U.S. casinos. Webb patented his intellectual property and worked hard to sell it. A casino in Mississippi was the first to introduce it. In 2002, the U.K. changed regulations to allow three card poker to be played. Play/Ante is played against the dealer. Whoever has the highest hand wins. Pair Plus is a side bet where the player wagers on whether they will be dealt a pair or better. Winning at three card poker takes minimal strategic thinking, but like blackjack it isn’t just simply about the luck of the draw. While blackjack players need to learn dozens of card combinations to develop a well-honed strategy, three card poker is a relatively simple, slow-paced poker game. The players and the dealer each get three cards. Whoever has the highest hand wins. Simple. 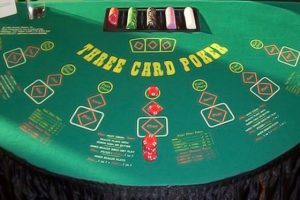 Table Layout in Three Card Poker: The layout is easy to follow and has opportunities for three bets: the ante, the play, and pair plus. In brick and mortar casinos the rules are printed on the table. Starting Three Card Poker: The player makes a bet to start on the ante. A one-dollar bet is fine, but some casinos require a $5 or $10 minimum bet. Three cards go to the player and the dealer each – no peeking. The dealer’s cards are face down. An equal amount must be placed on the ante and the play. A player can make another bet on the Pair Plus. Note: Experienced players recommend folding on any hand that does not contain one of the following: an ace, king, queen, pair, straight, flush, or straight flush. The Dealer’s Cards in Three Card Poker: When the dealer turns up his three cards, he must have a queen or higher to qualify to play. The Dealer with No Queen or Better: If the dealer does NOT have a queen or higher, the players win their ante bet, and the play is a push (or tie). When the Dealer Qualifies: When the dealer has a queen or better and qualifies to play, the cards are compared to the player’s cards, and whoever has the highest hand wins. The Pair Plus bet is a separate bet in three card poker. It can be made with or without the ante and play bets. The dealer’s hand has no bearing on it. A player who is dealt a pair or better wins the bet. The house edge in a pair plus bet will range from just over 2.3% to 7.27%, with the highest edge for a straight flush. Side bets in casino games such as roulette or craps usually have a high house edge and become quite difficult to win. Get used to beating the dealer when playing three card poker. On occasion make a pair plus bet if you’d like, but don’t make this bet a normal part of your overall strategy. Single cards – queen, king or ace high. Note: Even a pair of non-face cards has a chance of beating the dealer, so it’s typically worth playing. Flush – cards of the same suit. Straight – consecutive cards of any suit. 3 of a Kind – 3 cards of the same value. Straight flush – cards of the same suit in sequence. A player with a straight or better gets an ante bonus. The player doesn’t even need to beat the dealer. Note: A player who gets a straight and loses to the dealer will still receive the ante bonus. It’s easy to learn three card poker, and one of the best ways to begin is by playing a few hands for free at an online casino. After you become accustomed to the game play and strategy, you can start playing with real money to beat the dealer and win bonuses.